The Bell 201 (military designation XH-13F) was a modified Model 47G. The Bell 201/XH-13F was Bell's first helicopter to use a turbine engine. The Bell 201 was built to test components for the new XH-40, Bell Helicopter's prototype for its UH-1 Iroquois. The Bell 201 was powered by one Continental CAE XT51-T-3 turboshaft engine producing Template:Convert. The Continental engine a license-built development of the Turbomeca Artouste. The 201 first flew on October 20, 1954. The helicopter finished initial flight testing and was handed over to the US Army in April 1955 for further testing. ↑ 1.0 1.1 Donald, David, ed. "Bell 47". The Complete Encyclopedia of World Aircraft. Barnes & Nobel Books, 1997. ISBN 0-7607-0592-5. ↑ Day, Dwayne A. "Bell UH-1 'Huey'". US Centennial of Flight. ↑ Apostolo, Giorgio. 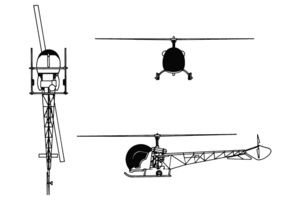 The Illustrated Encyclopedia of Helicopters, pp. 46-47. New York: Bonanza Books. 1984. ISBN 9780517439357. ↑ Spenser, Jay P. "Bell Helicopter". Whirlybirds, A History of the U.S. Helicopter Pioneers. University of Washington Press, 1998. ISBN 0295980583. This page was last edited on 8 October 2009, at 15:03.